I was scrolling through the pictures on my iphone the other day and realized there was a picture that I snapped ages ago while walking past the Ritz and kept on forgetting to check out. There were two signs, one for Bina Osteria and one for Bina Alimentari - I thought both were for the same place, so I only snapped 1 photo. Well, I finally remembered to go to the website and check it out. Apparently the two upcoming storefronts come to us courtesy of the "the brother/sister team that brought you Lala Rokh and Bin 26 Enoteca." Bina Osteria will be: A neighborhood Italian restaurant and bar with a seasonally changing menu. Open daily serving lunch, dinner and Brunch. Bina Alimentari will be: A European gourmet food shop with prepared foods, cheeses, salumi, wine, teas, coffees and much more. Sounds kind of like a Garden of Eden & Lionette's combo - which is basically where I ate every night while I lived in the South End. Well, Lionette's and B&G Oysters. Yum. I can't wait to see how these two places turn out. Click (here) to go to the Bina website. 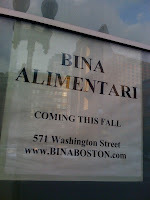 0 Response to "Bina Osteria & Bina Alimentari"